Till 4 Feb 2018 R&B Tea: Enjoy 1-for-1 Brown Sugar Boba Milk at Marina Square & Toa Payoh Outlets! 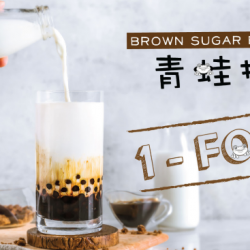 Introducing Brown Sugar Boba Milk '青蛙撞奶', now available at R&B Tea! Warm, chewy tapioca pearls meets chilled fresh milk in this pleasing combination that's an instant perk-me-up! Taste the yummy brown sugar flavour in the chewy pearls, made using a unique recipe. To celebrate the launch, they are running a 1-for-1 promotion starting tomorrow till Sunday at both Marina Square and Toa Payoh outlets!